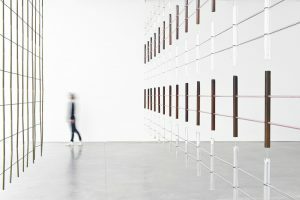 Hanging in the south gallery, 17 new modular partition systems are exhibited for the first time in France. Conceived from removable elements made of ceramic, aluminum, glass or textile, each wall offers a new geometry to divide space. Ronan and Erwan Bouroullec work on the diversity of patterns, the richness of shapes and the variation of the luminous effects on the matter to create a flourishing space layout. This part of the exhibition charts more than twenty years of collaboration between the studio and important furniture editor such as Vitro, Hay, Alessi, Magis, Artek or Samsung. Deployed in the North and East galleries of the Frac Bretagne, the exhibition is dedicated to some industrial projects: chairs, tables, desks, plates or jewels. Some objects are associated with free drawings, booklets, models, film samples and other marks of their private archives.